Mastication literally means "the process of chewing." 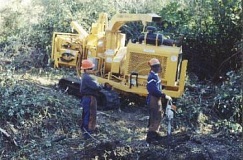 A Masticator is a large piece of equipment that is designed to mow and shred brush (such as blackberries) Manzanita, Toyon and other scrub trees as well as tall grasses. Mastication is a cost-effective way to process large expanses of land and is suited to flat and gently sloping conditions. It cannot operate in steeper conditions or where rocky conditions won't allow it to do its work close to the ground. The processed material left by the masticator is larger and shredded in appearance versus a finer-chipped mulch product. This is an efficient and cost effective method of cutting down large expanses of various grasses that are typically found in fields, meadows and pastures to reduce fire danger. It is suitable for flat and gently sloping land conditions. 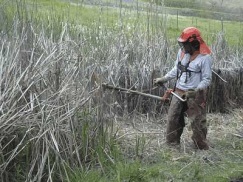 There are several conditions that are not conducive to mechanical brush mowing (Mastication, see above) to remove brush. 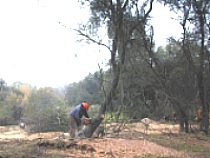 If you've got conditions that are moderately sloping or severely steep, rocky, heavily treed, or that is peppered with creekbeds, boulders and ditches, then the brush must be removed from the ground by hand (chainsaw). Once the brush has been removed, it needs to be processed into smaller material so that it is not a fire hazard and an eyesore. We use track-mounted chippers to process the material into fine-textured chipped mulch that can be left on-site and is actually beneficial - it can keep down weeds and provide nutrients to the soil below. We are one of the only companies in the Sacramento, Placer and Nevada County areas that have this state-of-the-art chipping equipment, which brings you several advantages over conventional chippers. Please visit the Equipment section on our "Commercial" page for more detailed information. Not only can we knock down these common nuisances for you, but we can set up a maintenance program that will keep them down year round. If blackberries or poison oak are growing in flat or gently sloped areas, they are most effectively removed by Mastication (see above). If these plants are growing in steeper areas, they must be removed with a chainsaw or pulled by hand (especially in the case of Poison Oak) and processed with a chipper. We will assess your property before beginning the work in order to advise you of the appropriate method. We're aware that blackberry thorns and the risk of contracting poison oak rash are hazardous conditions. Be assured that our crew is trained on proper methods of removing these hazardous plants and that our company is insured appropriately to cover instances of injury and illness related to this work. We can take out specific trees you would like removed, or remove a series of non-specific trees in areas where tree growth is overly-dense to improve appearance, visibility, functionality or fire-hazardous conditions (referred to as "thinning"). A chainsaw is used to drop the tree, then we'll process the trunk and limbs with one of our track-mounted chipper units into fine-textured chipped mulch, which can remain on the property. We can process tree trunks up to 18" in diameter. For larger trunks, we'll either cut them into fire wood for you or coordinate removal, whichever you prefer. In addition, stump grinding can be arranged. For the removal of trees that need extra care to be pruned or removed so as not to cause damage to closely-located structures, like your house (called "dangerous trees"), we refer the work to one of our Tree Service or Arborist alliances. Removing tree limbs is often desirable to improve appearance and visibility on your property, and necessary to get rid of dead branches and overgrown conditions can pose a fire risk. Working with a chainsaw, our crew selectively removes unwanted limbs to achieve the desired results. The waste material is then processed with one of our track-mounted chipper units into a fine-textured chipped mulch material that can be left on-site. Our crew is trained on the methods of branch removal that are necessary for healthy sealing of the scar and discouraging insect and disease problems. 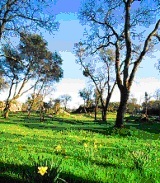 mowing, as well with hand-held equipment to most effectively tackle weeds in a variety of conditions. To keep weeds under control, we will recommend a program of ongoing maintenance specific to your conditions. Many times our clients have a specific project in mind that dictates clearing a larger or specific expanse of land to make way for construction. These situations are more "project driven" rather than "task driven," and can include anything from a single family home to a subdivision, apartments to neighborhood retail centers, parks to playing fields, or even establishing firebreaks along a mountain ridge. Just describe your project vision and we'll recommend the task, method and equipment needed to help get you there. We will also be sensitive to certain aspects of the site you wish to preserve for function, aesthetic preferences, environmental protection requirements, or otherwise. Any combination of the services described above may be recommended to achieve your goals.